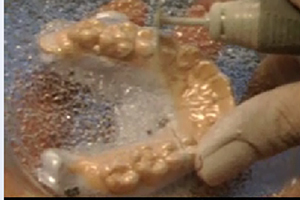 An anterior bite plane appliance can easily be fabricated in the office while the patient is there. It is a quick and easy process. Additionally, without posterior contacts as the muscles release and the condyles seat no posterior interferences are picked up that require monitoring and adjustment, so the process is efficient. In this live-patient demonstration video, Dr. Brady details the intricate steps of fabrication, try-in, adjustment and patient care instructions. 1. List indications for an anterior only appliance. 2. Describe the steps in fabricating and anterior bite plane appliance. 3. Understand how to adjust the appliance. 4. State patient care instructions. Dr. Brady reveiws the indications for an anterior bite plane appliance. Dr. Brady begins the step by step process to fabricate an anterior bite plane appliance. Dr. Brady continues the step by step process to fabricate an anterior bite plane appliance. Dr. Brady demonstrates how to adjust the anterior bite plane appliance.